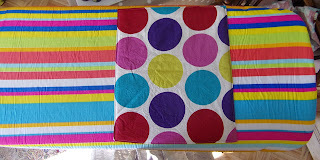 Feltabulous: A bit of upcycling - or should that be 'Make do and Mend'? A bit of upcycling - or should that be 'Make do and Mend'? 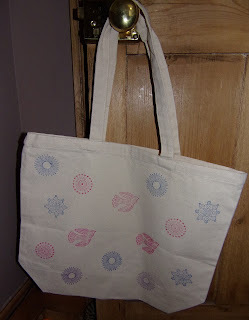 I was given two very nice thick cotton bags which was great. However, there was a company logo printed on them which I didn't really want to see. I made a calico patch and sewed it over the offending logo and then printed some patterns using wooden stamps and fabric paint. I was really pleased with the end result. You can see the patched side above. The other side of the bag, without any logo. 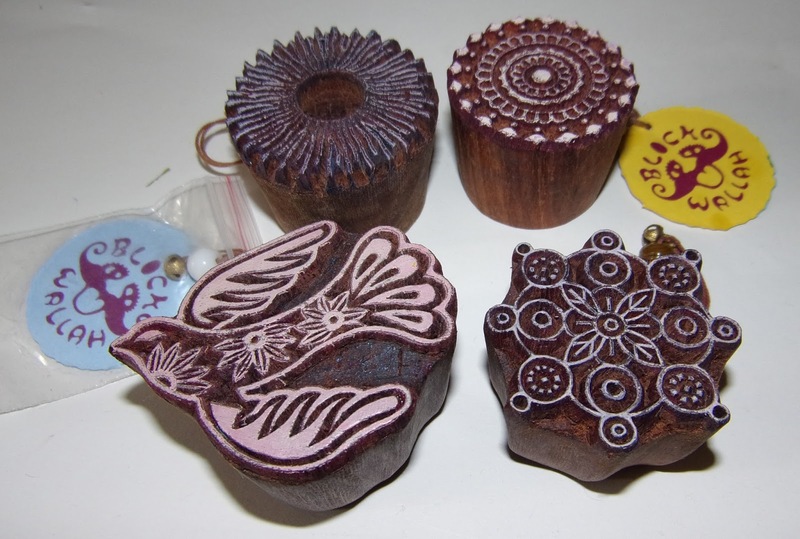 The stamps I used were Blockwallah stamp blocks which are hand carved in India out of a type of rosewood. They are very decorative and beautiful in their own right and if I had an empty shelf, I would display them. (I bought mine from Create and Craft and I have bought them all with my hard earned money - no sponsoring or freebies here!) I thought I would post about them because I really like them. Buoyed by this success, I attempted another project. I was going to throw the ironing board cover out because it had worn where the iron usually stands. Then I had a brainwave and located an old cover which I had kept as a spare. I cut a piece from that and patched it over the current cover and hey presto, a cover that we can still use. OK, it looks a bit odd, but at least the colours work! Now, what else needs sorting? Two brilliant makeovers!! 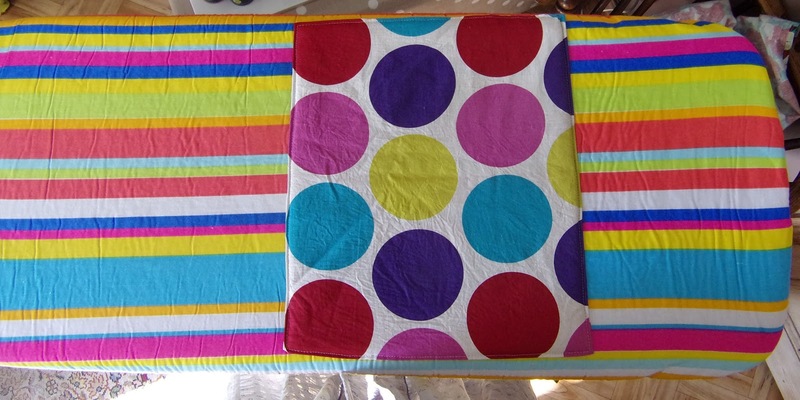 I really like the ironing board cover and the colours go well together. Your stamps are beautiful, they would be lovely just to look at wouldn't they. 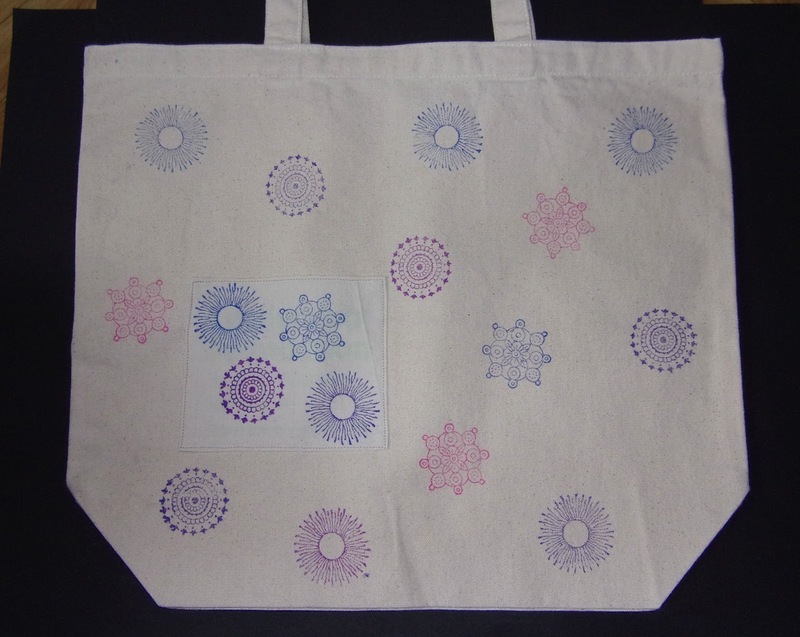 Enjoy the second bag makeover. I made one myself covered in patches of patchwork hexies and I really like it so I hope you will like yours! Thanks, Amy. I was really happy with the way these projects turned out. I am busy making the hexagons ready to be sewn together and am looking forward to seeing the end result there too. I'm enjoying these small and quick to do projects! Love your bright and cheery ironing board. NOT a job I enjoy. Those bags look great too. All your making do & mending looks great, particularly the ironing board. Thanks, linny. I have really enjoyed these projects and am so pleased that I have usable covers and bags. I really should do more recycling/make do and mending, rather than being too quick to throw things away.